We made the long drive down to the Santa Lucia mountains last weekend. After a season in the Sierra, I was underwhelmed. 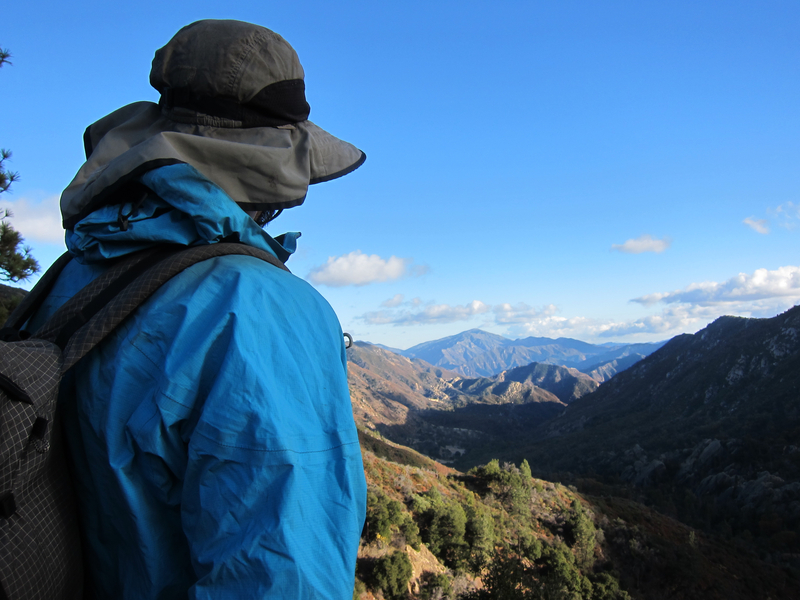 The view of the rugged, and challenging, Monterey District of Los Padres National Forest. I don’t want to dwell on the negative so I’ll get it out of my system. The trails in Ventana are frequently in terrible shape. Descending from Pine Valley wasn’t much fun. The trail was severely overgrown and the tread was collapsing. If you have the resources, consider helping out. Thrashing through chaparral stinks. Even though the hiking wasn’t the best, it was still really nice to get out. My little economy car made it down the dirt road to the trailhead just fine. It had snowed about two inches the night before. The crisp air, crunchy trail and fall colors were all very enjoyable. We pulled into camp after meeting a couple of day hikers and two hunters. I’ve got a new Jetboil and we made a nearly ridiculous number of drinks to relax and warm up. It’s winter and it’s probably time to start having campfires again. Our camps in Pine Valley and Hiding Valley were really very nice. The first night was under a large pine. The second night will be remembered for the changing maples and shaded Carmel River. Sunday afternoon was enjoyed with a camera, a stretch, a stroll and even more hot drinks. We slept about 12 hours each night.